Join us on an unforgettable, fully managed and escorted luxury adventure. So much to see, so much to do, so much to experience. Spectacular golf along the Garden Route is just the tip of the iceberg of experiences that await. Be pampered with luxury accommodation. Spoilt with spectacular golf at Simola, Pezula, Fancourt Links, Fancourt Montagu, Pinnacle Point and De Zalze Golf Courses. Breathe in the spirit of the wild on safari. Take the ferry to Robben Island. Ride the cableway to Table Mountain and the funicular to the Old Lighthouse. Feel the wind in your face on a chauffeured vintage motorcycle sidecar tour of the Cape Peninsula. Marvel at a 1903 Ford Model A and the beauty of a 1925 Bugatti. Pet an ostrich. Yes, you could do that too. An extraordinary adventure awaits you! Book your place now on this small group luxury tour, filled with the best golf, amazing tours and glorious accommodation. The trip starts with 4 nights in the vibrant Mother City of Cape Town. Be enchanted by Cape Town on a guided full day tour including Robben Island and Table Mountain. Then tour the Cape Peninsula, Boulders Beach and Kirstenbosch Gardens on a full day chauffeured sidecar tour! You’re bound to be mesmerised by this amazing city. Be utterly pampered with 5-star accommodation at The Taj, with 24-hour butler service, Club Rooms and evening drinks and canapes. Day 4 sees the start of our 1000 km adventure to Kariega along the Garden Route. Our first stop is the Cape Winelands where we experience the old-world charm of the landmark 5-star Lanzerac Wine Estate, steeped in history and dating back to 1692. Take in the sights on the Wine Tram, enjoy wine tastings at Lanzerac, Boschendal and Babylonstoren, tour the Franschhoek Motor Museum, billionaire Johann Rupert’s collection of cars, bikes and bicycles dating back over 100 years. Play golf at De Zalze, a course where good strategy and placement is essential. Ranked in South Africa’s top 20 courses for good reason! Day 6, and we’re on our way to Fancourt, awarded the Editor’s Choice Award for Best International Golf Resort 2018 by Golf Digest and home to South Africa’s top-rated course, Fancourt Links. Play the Links and Montagu courses, enjoy a wine tasting, see the spectacular rock formations of Meiringspass en-route to the historic town of Oudtshoorn and the Ostrich Ranch. Play Pinnacle Point on Day 9 before heading to the heart of the Garden Route, Knysna. Pinnacle Point is one of the most scenic courses in the world with dramatic ocean views and breathtaking terrain. The four majestic holes with ocean and cliff carries will be permanently etched in your memory! We stay at 5-star Pezula Hotel Resort & Spa on the Knysna clifftops for 3 nights, with views of both the Knysna Lagoon and the Indian Ocean. Soak up the charm of Knysna, watch the sunset on a cruise to Knysna Heads and play at two beautiful golf courses - Simola and Pezula. Six amazing rounds of golf later and you will have to agree that the Garden Route and golf are unarguably a match made in heaven. Now, imagine the exhilaration of adding a wildlife safari into the mix. This mindblowing adventure concludes with an up-close encounter with the majestic Big 5 at Kariega, where we stay at River Lodge for 2 nights, full-board, with early morning and evening game drives. Pack your camera, and you're all set for the holiday of a lifetime! EARLY BIRD OFFER of $500 discount per person for booking by 1 May 2019 - From $8,750 Per Guest Double Share, Non-Golfing partner $8,039 (land only). Access to the private Club Lounge for complimentary breakfast and evening cocktails with canapés. Complimentary Shuttle Service to V&A Waterfront. Breakfast – a full continental buffet and hot breakfast on order, complete with tea & coffee. Select mini-bar, replenished once daily. A complimentary transfer service between the Hotel and Stellenbosch town at set times. A spa voucher to the Value of R590. A dinner voucher to the value of R345. 3 nights at 5-Star Pezula Hotel, Knysna in a Deluxe Suite with breakfast. 2 nights at 4-Star Kariega Game Reserve - River Lodge in a Safari Lodge Suite. Full-board including morning and evening game drives with experienced trackers. 1 round at De Zalze Golf Club in a shared cart. Non-golfers spend the day in Stellenbosch. 1 round at Fancourt Montagu Course, in a shared cart with a halfway-house light lunch. Non-golfers explore the resort’s facilities or make use of the complimentary spa voucher. 1 round at Pinnacle Point Golf Club in a shared cart. Non-golfers visit the renowned archaeological site at Mossel Bay for the Point of Humans Origin Tour followed by a sensory wine tasting/pairing with tapas at Jakkalsvlei Wine Farm. 1 round at Fancourt Links Golf Course, including a caddie and halfway-house light lunch. Non-golfers depart for Plettenberg Bay after breakfast. Join a Dolphin and Eco Cruise (2hrs), then spend some time at the Knysna waterfront. 1 round at Pezula Golf Club in a shared cart. Non-golfers - day at leisure. 1 round at Simola Golf Club including shared cart and halfway-house light golf lunch. Non-golfers - return transfer with a guide to visit Birds of Eden Free Flight Sanctuary and the Primate Sanctuary. A walking tour of the city viewing the Company Garden, Houses of Parliament and South African Museum. A guided full day tour of Cape Town, including Robben Island and Table Mountain. Experience Robben Island with a guide who is either an ex-prisoner or family member of an ex-prisoner. Full day side-car tour of the Cape Peninsula. Includes Boulders Beach, Chapmans’ Peak, Cape Point, a funicular ride to the lighthouse and the Kirstenbosch Botanical Gardens. A tour of Oudtshoorn with a visit to an ostrich farm. Lunch included. A driving tour through the spectacular rock formations of Meiringspas. Wine Tastings at Doornkraal, Lanzerac, Boschendal and Babylonstoren. Franschhoek Wine Tram hop-on-hop-off tour. A tour of the Franschhoek Motor Museum. A sunset cruise to Knysna Heads. Point of Human Origins Tour at the Mossel Bay archeological site. Sensory wine tasting/pairing with tapas at Jakkelsvlei Wine Farm. Join a Dolphin and Eco Cruise (2hrs) at Plettenberg Bay. Visit the Birds of Eden Free Flight Sanctuary. Fully escorted by On The Tee host. All transfers, porterage and driver gratuities. Daily and overall golf prizes. Meals and drinks not included in the itinerary. Transfer from Cape Town International Airport to Taj Cape Town on arrival. A bottle of premium South African Wine in your room as a welcome gift. Bottled water, fresh fruit and flowers placed in your room daily. Evening drinks and canapes in the Club Lounge. Access to fitness centre, Jiva Spa, indoor heated pool and hot tub facilities. Complimentary shuttle to Victoria and Albert Waterfront. Overnight - 5-star Taj Cape Town in a Club Room. 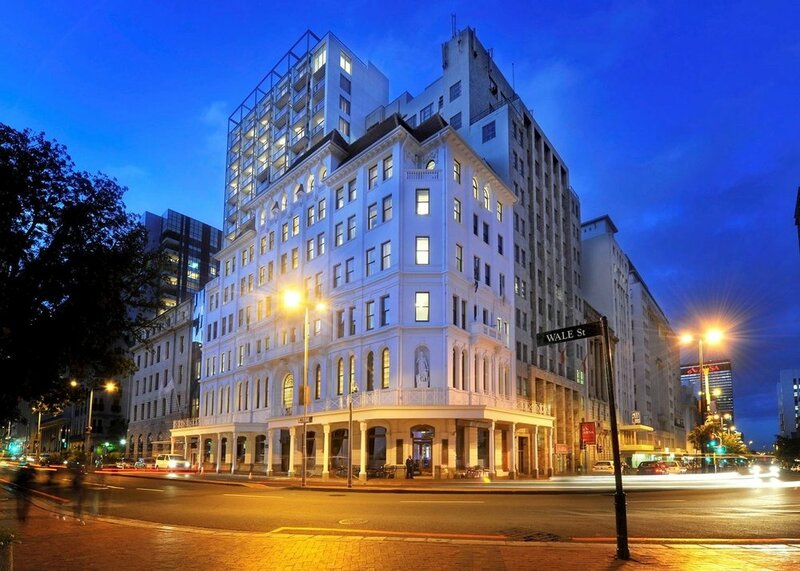 Taj Cape Town effortlessly combines the legacy of the old with the luxury of the new. Located in the centre of the old city, it boasts a strong sense of place and is within walking distance to some of South Africa’s foremost landmarks and attractions and an eclectic array of shops, galleries and restaurants. Breakfast in the private Taj Executive Club Lounge. High tea in the Lobby Lounge. Welcome Dinner at Pigalle, Green Point. Full Day Cape Point Vintage Side-Car Adventure Tour. Includes use of all riding gear (leather jacket, helmet and goggles). Head out to Maiden’s Cove via Atlantic seaboard. Continue along the coast towards Cape of Good Hope via Chapman’s Peak Drive, Noordhoek, Oceanview and Scarborough. Re-board your side-car and head to Boulders’ Beach penguin colony. Kalk Bay via Simonstown and Fish Hoek is next up. Stop for a lunch - at own expense. We then make our way to Kirstenbosch Botanical gardens before heading back to the city. Evening drinks and canapes in the Taj Club Lounge. Take the ferry to Robben Island and hear first hand the experiences of the prisoners from your guide - either an ex-prisoner or a family member. Return to the Taj in the late afternoon. Transfer to Stellenbosch. Non-golfers stay and explore the town. Round one of the golf competition is at Golf at De Zalze Golf Club. Shared cart included. Complimentary transfer service between the Hotel and Stellenbosch town at set times. Overnight at 5-star Lanzerac Resort and Spa in a Classic Room. The De Zalze Golf Club is situated within the De Zalze Winelands Golf Estate in Stellenbosch. A full continental buffet and hot breakfast on order. Franschhoek Wine Tram, hop-on-hop-off tour. Wine tastings at Lanzerac, Babylonstoren and Boschendal. Tour of the Franschhoek Motor Museum. Round 2 of the competition is at Fancourt - Montagu Course. Shared cart and light golf lunch at halfway house included. Non-golfers - a rest day to explore the resort’s facilities or make use of the complimentary spa voucher. Overnight at 5-star Fancourt Resort in a Classic Room. Golfers - transfer to Pinnacle Point for Round 3 of the competition. Shared carts included. Point of Human Origin Tour at the Mossel Bay acheoelogical site. Full day Oudtshoorn Day Tour. Guided tour of Safari Ostrich Park including lunch. Free evening. Opportunity to make use of your complimentary dinner voucher. Round 4 of competition at South Africa’s top-rated course, Fancourt Links. Includes caddie and halfway house lunch. Spend some time at Knysna waterfront before checking into the hotel. Overnight at 5-star Pezula Hotel in a Deluxe Room. Round 5 of competition at Pezula Golf Club. Includes shared cart. Freshen-up after golf for an afternoon cruise to Knysna Heads (meal and drinks at own expense). Overnight at 5-star Pezula Resort Hotel in a Deluxe Room. Transfer to Simola Golf Club. Round 6 of golf competition at Simola Golf Club. Includes shared cart and halfway house golf lunch. Transfer to Kariega Private Game Reserve. Dinner and evening game drive. Overnight at Kariega River Lodge in a Safari Lodge Suite. Breakfast, lunch and dinner (with select beverages). Transfer to Port Elizabeth Airport. POST-TOUR TO VICTORIA FALLS ( 28 APRIL to 1 MAY) DEPARTS FROM PORT ELIZABETH. Please feel free to contact Ria with any questions. We look forward to welcoming you oon this tour. This is a small group luxury tour, contingent on a minimum of 10 guests. The maximum group size is 16. The tour starts from Cape Town International Airport on 14 April and ends with a transfer to Port Elizabeth Airport on 28 April. A $500 early bird offer applies to bookings by 1 May 2019. A $2000 deposit secures your place, should the minimum number of bookings required to proceed not be achieved, your deposit will be refunded in full. The deposit is non-refundable after the minimum threshold of travellers is reached. Please do not book flights until you are advised that the minimum threshold has been reached. Please read the full Conditions and Terms of Service. Price from $9250 Per Guest Double Share, Non-Golfing Partner $8539 (land only). Single Supplement of $2,950. From $8,750 Per Guest Double Share, Non-Golfing partner $8,039 (land only).